Red or black color is a very favorite way of betting in Roulette. In this test, simulating 100,000 Roulette spins, we keep betting the same amount of money on randomly chosen color and follow the development of our cash balance and as well as its final value. We evaluate this way of betting as it is not a "system" or a "strategy", whereas we bet according to some key and/or change the size of bets. The test, its outcomes and findings could be applied to any even-money bet in Roulette. The even-money bets are those with the payout 1:1. Except for red or black color they include also even/odd and low/high numbers. All of these bets provide equal winning (or losing) chances from the probability point of view. However red or black belong to the most favorite ones. Perhaps because they are easily recognizable after a spin and there is no need to think about whether the number is even or odd or whether e.g. number 18 is still low (1–18) or high (19–36). Like the other Roulette tests, even this one is based on an Excel simulation of 100,000 Roulette spins. The first 20 spins are shown in the Table 1 (see below). In each spin we pick up a "Color" on random basis and bet $5 on it – the amount does not change at any time during the test regardless of winning or losing. Then also a "Winning Number" is selected randomly as each number in Roulette has a fixed color. In this test we alternate the colors we bet on, although we know that from a probability point of view it does not matter, which color we pick. If the colors in the columns "Color" and "Winning #" are the same, we win $5 netto and add it to the running cash "Balance". If the colors are opposite or the zero comes up, the bet loses instantly, which results in the net loss of $5 and decreases the "Balance". We start with a null balance, which indicates that it does not matter how much money we have in our pocket. We suppose that we have enough money for betting regardless of eventual negative balance. We play the French Roulette (with a single zero only), while the even-money bets are not frozen, but lose instantly in case the zero comes up. 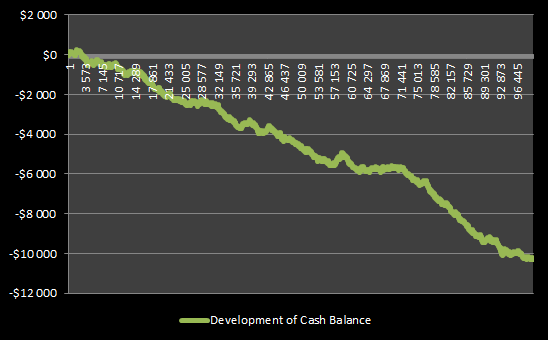 The progress of the cash balance during the spins 1 to 100,000 is best displayed by a chart – see the Figure 1 below. 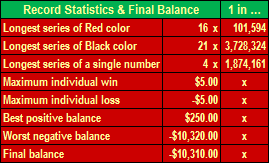 There are the spins on the horizontal axis x, while the vertical axis y represents the development of the cash balance throughout this test of the betting on red or black color in Roulette. We can notice that our balance was positive at the beginning of the test only. With increasing number of spins, and a few exceptions, the balance was steadily declining. The final balance displays the loss of more than $10,000, which is quite enough considering the $5 bet made in every spin. The exact figures and various record statistics are given in the Table 2. We can see that our best positive balance was $250. That was at the beginning of the test, then it took the declining trend and our worst negative balance $10,320 did not differ a lot from the final balance. The record series of the same color are quite interesting. The red color appeared in 16 consecutive spins, while the black color even 21 times in a row. The column "1 in ..." shows the probability of such events. The probability of any color to come up 21 times in a row is only 1 in almost 4 million, precisely 1 in 3,728,324! The probability of a single number to come up four times in a row (as it happened) is also very low: 1 in 1,874,161. There were three different numbers that came up 4 times in a row at various moments of the test. Number 24 occurred in four consequent spins 34,143 to 34,146, number 20 in the spins 49,321 to 49,324 and finally number 8 in the spins 81,139 to 81,142. 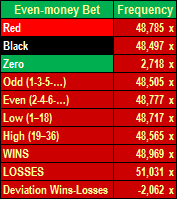 Table 3 provides frequencies of red and black color (regardless of the outcome of the bet), but also other even-money bets. The total of the frequencies of even-money bets and zeros must logically equal 100,000 Roulette spins. 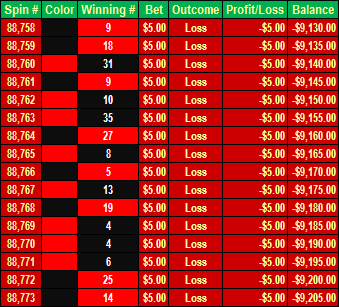 The column "WINS" says how many times we succeeded to get the color right, while the column "LOSSES" presents the opposite color or zeros. We can also see that the number of losses were bigger by 2,062 spins. If we multiply it with $5, we get to the final balance of -$10,310. The longest winning series took 18 spins – see the Table 4. It meant that 18 times in a row we succeeded to get the color correctly (or actually it was by the simulation). The bet was always the same: $5. This series brought us net profit of $90. However it was a weak solace as our cash balance improved to right below -$5,000. 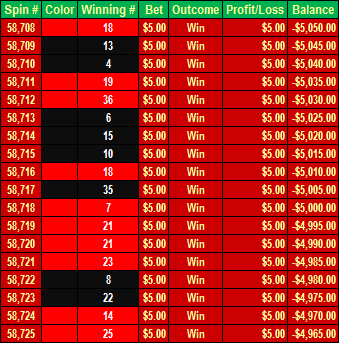 Table 5 presents the longest losing series that took 16 consequent spins. Sixteen times in a row we guessed different color than it was spun. The series cost us $80 and our balance decreased by this figure. The series occurred at the end of the test, when our cash balance was bad enough anyway. The even-money bets in Roulette, especially betting on red or black color, are very popular. However the test and its course (see the Figure 1) proved that it was not a good strategy to win or to preserve a reasonable balance in Roulette. The house edge took shape very soon. At the beginning of the test we were able to earn a bit, but afterwards it was followed by a steady decline. We do not support this statement by this test only. As the simulation was carried out in Excel, it was possible to repeat it numerously. 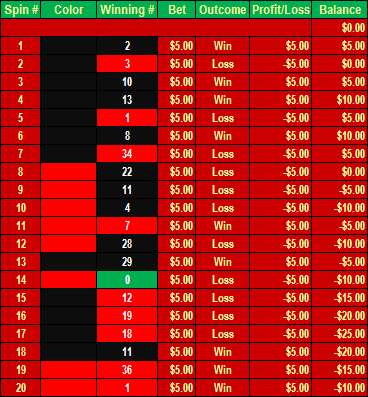 The trend was always very similar: gradual decline that ended with the loss of about $10,000 to $15,000 (and that all with the single bet of $5). To achieve positive final balance by this way of betting turned out to be virtually impossible. In this regard it would maybe lose to the Martingale system, which is very risky (due to doubling of the bets after a lost spin), but whose progress is not that dull and depressive with only a small hope to change the course of events – see e.g. the 2nd Martingale test with micro bets. The situation will be much more favorable with betting on single numbers.